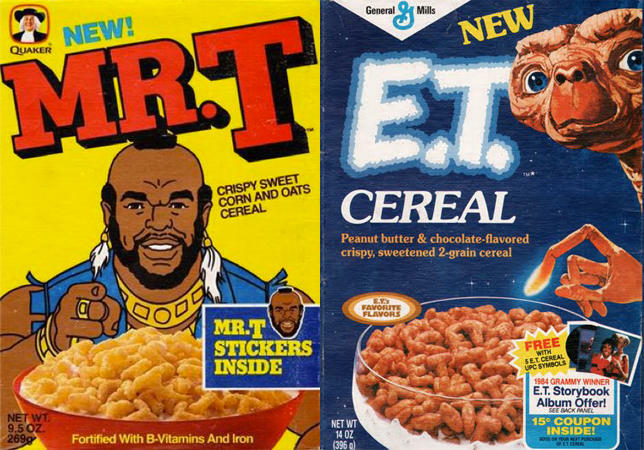 Mr. T cereal debuted in 1984 and was essentially T-shaped captain crunch. But it got a little more cool when it teamed up with Pee Wee’s Big Adventure. "Kids didn’t just cuddle E.T., they ate him." When movies inspire cereals, the commercials sound like trailers. The kids become part of the action and eat like the stars. Less likely products have tested the waters, including the Nintendo Cereal System, a cereal featuring Mario and Zelda. Barbie got into the game, too, inviting kids to her breakfast party. One clever box for Barbie’s cereal was designed to be cut up and folded into a Superstar Barbie Vanity Table. What’s interesting about these cereals is how they differ from other promotions like posters or lunch boxes or bed sheets. Kids didn’t just cuddle E.T., they ate him. It’s a connection between products and characters that goes beyond accessory and right into the digestive tract. This commentary originally aired March 12, 2013. Kellogg’s rushed Pop-Tarts onto the market in 1964, shortly after their competitor announcement a similar toaster snack release called Country Squares. Since then, the evolution of the Pop-Tart has been long and strange. Pop-Tarts began simply, with a handful of flavors. Though they come wrapped in tinfoil and ready-to-eat, they’ve always been closely tied to the toaster. Pop-Tart’s first mascot was an animated toaster named Milton. Since the first simple arcade games were developed in the late sixties, the video arcade has fought a war of innovation and marketing with home gaming. What’s called The Golden Age of arcades was sparked by the 1978 release of Space Invaders. The game was so successful, in fact, that it brought about a shortage of the 100-yen coins used in the Japanese machines. In the following years, arcades were dominated by single player games like Pac-Man and other missions of skill, whether it was navigating the upward climb in Donkey Kong or scuttling across a busy road in Frogger.